Vince Boytler has worked in scaffolding since leaving school. He knows the height safety business inside and out, and appreciates how competitive it can be. Reputation is crucial in securing new business, especially when dealing with major contractors. As the managing director of Data Scaffolding, Vince wanted to move from the domestic housing market towards winning business from major building contractors. He realised that to make this transition, the materials and service provided needed to be efficient and of the best quality. These changes require a significant investment; the new scaffolding cost approximately $60,000 and staff training a further $1900. This investment, however, soon paid off. A reduction in insurance premiums from $66,000 to $30,500 over four years. The new scaffolding is easier to set up, so jobs are completed promptly and the main contractor can start sooner. Better scaffolding reduced the labour requirements, allowing two men to complete a job that previously needed three, saving approx. $1400 per man, per job. Industry recognition in the form of a Construction Award and Major Projects Division Certificate of Excellence in recognition of outstanding accomplishment and achievement for quality and safety. The scaffolding has a lifespan of approximately 25 years which is considerably longer than other less expensive systems on the market. No reportable accidents and high staff morale. With these improvements, Vince was able to move the focus of the business from the domestic housing market to major construction projects with higher returns. With many years in the height safety industry, Vince knows how dangerous it can be. He’s seen many serious accidents, which were often caused by poor scaffolding and training. To give his employees the safest working environment possible, he invested in quality materials and training. He also spends time ‘at the coalface’, working alongside his colleagues and other contractors, so that he can more easily monitor health and safety. He can therefore address safety issues when they arise. Vince’s presence onsite contributes to Data Scaffolding’s close knit environment. All employees were consulted in order to decide which systems would make their work safer and easier. All employees are trained in the use of the new scaffolding. Health and safety issues are discussed on a day to day basis. Vince empowers his team to address safety issues directly and, if necessary, challenge unsafe behaviour. 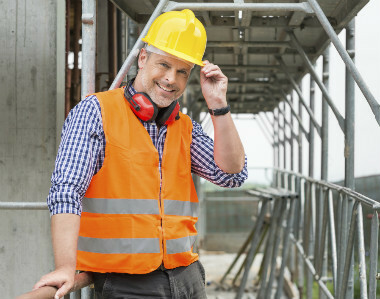 Employees feel safe and take pride in the excellent reputation Data Scaffolding enjoys with major contractors.